Dating movement in shear zones is of particular interest to structural geology and tectonics, but timing something as intangible as movement can be difficult unless there are specific phenomena that can be attributed to the associated deformation. Processes such as recrystallisation and/or the growth of new fabric forming minerals are candidate processes for which 40Ar/39Ar geochronology can be used to constrain the timing. However the new grown minerals need to be sufficiently retentive of radiogenic argon to allow those ages to escape significant modification during subsequent events. My work has shown that K-feldspar is retentive enough to allow such measurements. K-feldspars from the Wyangala Batholith, N.S.W. Australia were analysed, from mylonite shear zones and proto-mylonite zones (Fig 1). Arrhenius data allowed diffusion parameters to be estimated, showing mylonitisation caused argon systematics to reset because diffusion distances were reduced by cataclasis, deformation and/or recrystallisation. However, the mineral lattice remained sufficiently retentive to allow subsequently produced radiogenic argon to be retained. 40Ar/39Ar geochronology was thus able to constrain operation of these biotite-grade ductile shear zones to the period from ca 380 Ma to ca 360 Ma, at the end of the Tabberabberan Orogeny. Retentivity decreases from proto-mylonite to mylonite, implying that these parameters dynamically adjusted during deformation (Fig 2). Cooling was taking place while the mylonite continued to deform, resulting in both the age and the microstructure being frozen into the rock. Figure 1 Representative microphotographs of samples: (a) the proto-mylonite; and (b) the mylonite. In (a), the sampled groundmass (P1) grains are distortion-free, and bounded by microshear zones defined by quartz and mica, while the sampled porphyroclastic K-feldspar (P2) is preserved as single grains with twinning and minor crushing and fracturing of grains. 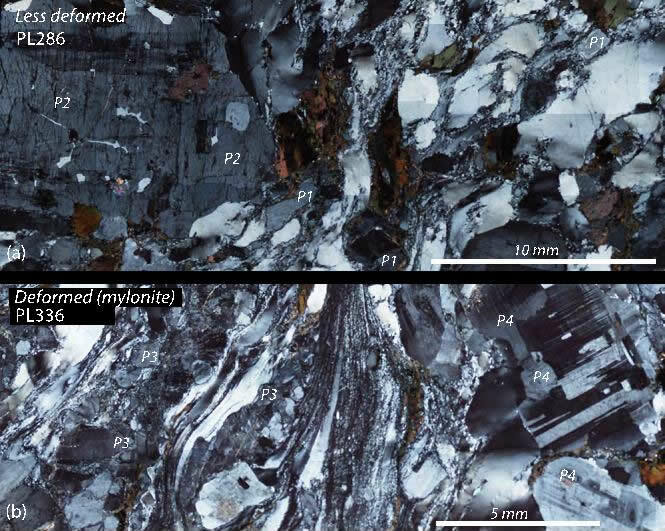 The mylonite (b) has undergone considerably greater deformation, but again the sampled groundmass K-feldspar (P3) does not show significant distortion, and grains are wrapped by ribbon quartz and fine-grained mica that define the mylonite foliation, while the sampled K-feldspar porphyroclasts (P4) are intensely cataclased. From Forster, Lister and Lennox 2014. 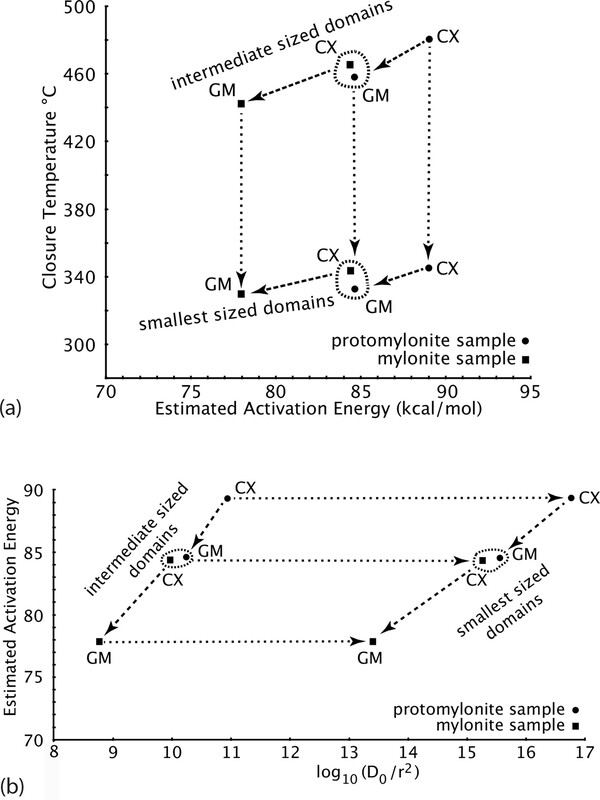 Figure 2 Plots of show that retentivity decreases from proto-mylonite to mylonite, implying that these parameters dynamically adjusted during deformation. (a) plot of activation energy vs closure temperature, for a 20°C/Ma cooling rate; and (b) plot of frequency factor vs activation energy. The dashed lines link data from porphyroclasts with data from the adjacent groundmass. The dotted lines link data for the intermediate-sized diffusion domains to those from the smallest diffusion domains, for each sample. From Forster, Lister and Lennox 2014.